"My entire family (meaning my parents, siblings, husband, and children) have all been extremely satisfied patients of Dr. Tom Maloney for over 30 years. Everything about his practice is exceptional: his skills as a dentist, his professional and yet very caring personality, as well as the people he has chosen for his staff of assistants, hygienists, and office personnel, all of whom are simply the best! The genuine warmth and friendliness of Dr. Maloney and his staff makes a visit to the dentist an easy and stress-free event. Dr. Maloney is extremely gentle and seems to take extra care and consideration of the patients' comfort level during every procedure. 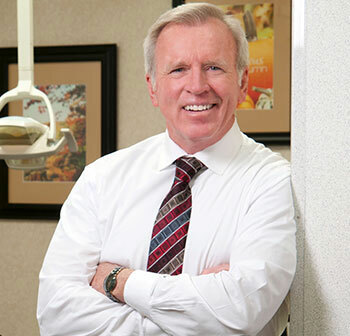 Everyone in my family shares the same opinion when it comes to Dr. Maloney: we have a great dentist!" "Dr. Maloney has taken care of my family's dental needs for 20 years, and we could not be happier. All three of my children actually look forward to going to the dentist! The office has always been extremely organized, the staff friendly, and Dr. Maloney very professional yet caring. Members of my family have had fillings, extractions, routine cleanings and xrays and have never had a complaint. I have had problem teeth my entire life and have always been extremely anxious when going to the dentist, but Dr. Maloney and his staff have made me feel as comfortable and relaxed as possible. I even had veneers applied to 6 upper teeth and made it through an all day appointment! As a patient, I am grateful for Dr. Maloney's expertise and commitment to perfection. As a mother, I am grateful to him and his staff for helping my children relax, learn about good dental health, and helping them maintain their lovely smiles! We moved from Mokena years ago, but we still return and drive the 45 minutes several times a year to keep Dr. Maloney as our dentist. I can't imagine going anywhere else." "We as a family first began to see Dr. Maloney in 1996 after moving to Mokena. We went to him based upon a recommendation received from our next door neighbor. In the last eighteen years, we have been so grateful for our neighbor's advice. We have experienced kindness and cooperation from every staff member at the practice. They have become friends, not simply professional health care providers. Dr. Maloney's greatest trait in his work is his attention to detail. He wants to get it right, not settling for anything short of what he would want for himself and his family. The practice has not only taken care of our normal cleanings, extractions, cavities and crowns. We also have worked through an Invisalign program that yielded great results. Without hesitation, like that neighbor so long ago, when asked who we would recommend for dentistry, Maloney Dental would be the answer." "I just want to drop you a personal note and thank you for all you do for my family and me. After 25 years plus of service that you have given us, I am sure you are simply the most skilled and caring professional I have ever known. I don't think I could express what you mean to me personally. I can think back on many things you have helped me with. The time you helped my mother with her dentures and had them repaired for me and never even saw her professionally. I just dropped them off and you had them taken care of. What a life saver you where that time. Then there was the time you did a root canal on me on New Year’s Day. Just you and I in blue jeans! That was so nice of you. I remember you told me I made a good assistant, even when I was the patient. That's what I call a true professional and a good friend. You always make me feel good about myself and say the nicest things about my wife, and children ~ which you have taken care of since they were born. My son is all grown up and now lives in New Jersey; He told me he misses you because he can't find a great dentist like you. My daughter Jenny says you treat here like a little queen and she really likes coming to you." "Just had my first appointment with this office, and I will definitely be sticking with them! The staff is phenomenal. Very nice, and very thorough. Dr. Maloney has a good thing going on here!" "GREAT DOCTOR AND STAFF!! My son had a peppercorn logged in his gum line deep and was looking for a dentist to treat him late in evening to remove this peppercorn that was burning in his gum line. Dr. Maloney and his staff stayed after hours to take my son in and treated him ASAP! They removed the peppercorn and were so very nice and did an outstanding job!! We are so happy with his professionalism and work!! GREAT JOB!! Highly recommend him and his staff!!"